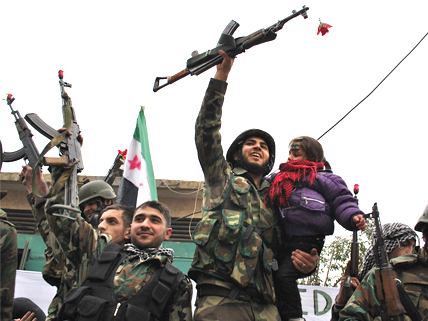 Syrian army defectors celebrate after joining protesters in Homs, Syria. Forces loyal to Syrian president Bashar al-Assad have killed an estimated 7,000 people in attacks on rebellious areas in their attempt to put down an 11-month-long anti-government uprising. Recent escalation is drawing heightened attention from the international community. Diplomatic measures have been taken, but on the ground within Syria, little changes. What can the international community do when a sovereign nation brutally represses its own people and ignores all entreaties? If there is to be international intervention, who should intervene, and how? In January, an Arab League delegation spent three weeks in the country assessing the situation—only to be roundly criticized as ineffective. In mid-February, the United Nations General Assembly condemned al-Assad’s brutal repression. UN ambassadors have called for a cease-fire, and the head of the UN Human Rights Council has accused Syria of “countless atrocities.” U.S. president Barack Obama strongly denounced the Syrian leader, saying he had “lost all legitimacy with his people.” But the UN Security Council has failed to act primarily because Russia and China have vetoed proposed resolutions to condemn or punish Syria. The situation has parallels to the revolutionary upheaval that enveloped Libya in 2011: a regime essentially at war against its own people, targeting civilians; a looming humanitarian crisis. In Libya’s case, the North Atlantic Treaty Organization (NATO), supported by a UN resolution authorizing measures to protect civilians, intervened with a bombing campaign that assisted the Libyan rebels to overthrow dictator Muammar el-Qaddafi. Thus far, the international community has responded differently in the case of Syria. NATO officials have stated clearly that the alliance won’t act without UN support. There are important differences, both geographic and military, between Libya and Syria. The latter is more mountainous, has a more limited coastline, and is surrounded by countries unlikely to allow basing of NATO forces. Moreover, its air defenses are superior to anything Qaddafi possessed. Lastly, the opposition controls only a few city neighborhoods. This article updates the Syrian crisis and the UN’s latest moves. Should the International Community Intervene In Syria, Even without Security Council Approval? This opinion piece explores the issues surrounding potential outside intervention in the Syrian conflict. Learn about UN Security Council deliberations on Syria and the rare “double-veto” that has stymied stronger UN action. This article examines differences between the case of Libya and that of Syria, in terms of the role of the international community; includes video interviews. this is irrelevant to the quiz!! !